Vacancy in DEE Assam Recruitment 2019 Apply Online dee.assam.gov.in 230 Jr. Assistant – Grade IV (Peon) & Other Posts Jobs Career Notification Advertisement on March 2019 dee.assam.gov.in Career, Latest Job Opening at Directorate Elementary Education (DEE) – Assam Recruitment 2019 Apply Online Application Form Download, Latest Jobs Notification for 230 Jr. Assistant – Grade IV (Peon) & Other Posts Vacancy in DEE Assam Recruitment 2019. Latest Jobs Career Vacancy in DEE Assam Recruitment 2019. Advt. No. : EAA/SIU/150/2017/264, EAA/SIU/393/2017/Pt/-44 & EAA/SIU/393/2017/Pt/-42. 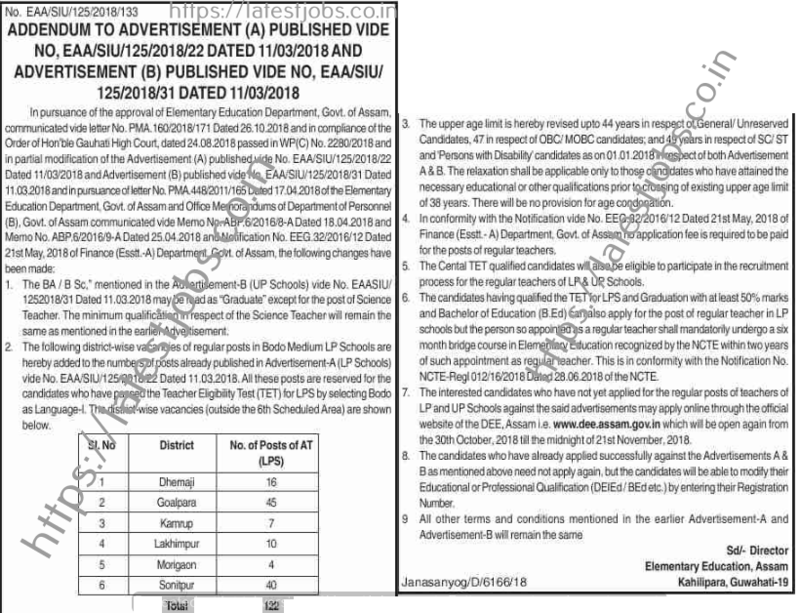 Directorate Elementary Education (DEE) – Assam Recruitment 2019 dee.assam.gov.in official website published a new Jobs Circular notification for 230 Jr. Assistant – Grade IV (Peon) & Other Posts vacancy on March 2019. Latest Jobs Career Opportunities in DEE Assam Recruitment 2019. Latest Govt. Jobs in Directorate Elementary Education (DEE) – Assam 2019 dee.assam.gov.in Career Recruitment news, 230 Jr. Assistant – Grade IV (Peon) & Other Posts Vacancy in DEE Assam Recruitment Notification Apply Online Application Form. DEE Assam Recruitment News for Jr. Assistant – Grade IV (Peon) & Other Posts . Eligible candidates may Apply Online from 08th Mar. 2019 to 30th Mar. 2019 (dee.assam.gov.in Career). Further details of Vacancy in DEE Assam Recruitment 2019 for Jr. Assistant – Grade IV (Peon) & Other Posts – Age, pay Scale, Eligibility Criteria, How to Apply & other details on Mentioned below. The name of the organization in Directorate of Elementary Education under department of Education, Govt. of Assam. It is located at Kahilipara, Guwahati 781019, Assam. The Director of the Elementary Education, Assam is the head of the Directorate of the Elementary Education. Many Job Seekers are waiting for DEE Assam Recruitment Notification Advertisement 2019 dee.assam.gov.in, Finally your dreams come true, on this week of March 2019 Directorate Elementary Education (DEE) – Assam published Notification Advertisement for 230 Jr. Assistant – Grade IV (Peon) & Other posts , Here You Can Find details Vacancy, Age Limit, Salary & how to apply for this job at DEE Assam on below. Name of the Recruitment /Organization Authority : Directorate Elementary Education (DEE) – Assam. Name of the Posts : Jr. Assistant – Grade IV (Peon) & Other. No. of Posts : 230 Posts. Closing Date of Application: 30th Mar. 2019. Stating Date For Apply Online : 08th Mar. 2019. Closing Date For Apply Online : 30th Mar. 2019. 1. Junior Assistant (Directorate of Elementary Education, Assam) 09 Pay Band-II (PB-2) @ Rs. 14000 – 49000/- + Grade Pay Rs. 6200/- per month plus other allowances as admissible under rules. 2. Junior Assistant (Field Level Establishment Under DEE, Assam) 58 Pay Band-II (PB-2) @ Rs. 14000 – 49000/- + Grade Pay Rs. 6200/- per month plus other allowances as admissible under rules. 3. Statistical Assistant (Field Level Establishment Under DEE, Assam) 08 Pay Band-II (PB-2) @ Rs. 14000 – 49000/- + Grade Pay Rs. 6200/- per month plus other allowances as admissible under rules. 4. Compounder (Field Level Establishment Under DEE, Assam) 03 Pay Band-II (PB-2) @ Rs. 14000 – 49000/- + Grade Pay Rs. 6200/- per month plus other allowances as admissible under rules. 5. Grade IV – Peon (Directorate of Elementary Education, Assam) 09 Pay Band-I (PB-1) @ Rs 12000 – 37500/- + Grade Pay Rs. 3900/- per month plus other allowances as admissible under rules. 6. Grade IV – Peon (Field Level Establishment Under DEE, Assam) 139 plus other allowances as admissible under rules. 7. Grade IV – Night Chowkidar (Field Level Establishment Under DEE, Assam) 01 plus other allowances as admissible under rules. 8. Driver (Directorate of Elementary Education, Assam) 03 Pay Band-I (PB-1) @ Rs. 14000 – 49000/- + Grade Pay Rs. 5000/- per month plus other allowances as admissible under rules. Minimum – 18 Years to Maximum – 44 Years. Qualification Details For Junior Assistant Post : Passed Bachelor’s Degree from a recognised University or any examination declared equivalent by the Government. The Candidate also must process computer skills for office productivity software tools independent of any operating system, i.e. MS Windows, Linux, Mac, etc. Qualification Details For Grade IV – Peon Post : Passed Class VIII. For Above Posts Candidates can apply through online mode. Online application till open from 08th Mar. 2019 to 30th Mar. 2019. STEP 1 : Logon to https://dee.assam.gov.in/how-to/apply-for-the-post-of-grade-iii-grade-iv-staff-under-dee-assam (Apply Online Link). Written Examination (OMR Based – 1st Phase & 2nd Phase). Directorate Elementary Education (DEE) – Assam 2019, Admit card / Hall ticket can be download from DEE Assam official website (dee.assam.gov.in) before 10 days for the exam. Details are available on official website. Vacancy in DEE Assam Recruitment 2018 Apply Online dee.assam.gov.in 122 Teacher Posts Jobs Career Notification Advertisement on October 2018 dee.assam.gov.in Career, Latest Job Opening at Elementary Education Department – Govt. of Assam Recruitment 2018 Apply Online Application Form Download, Latest Jobs Notification for 122 Teacher Posts Vacancy in DEE Assam Recruitment 2018. Latest Jobs Career Vacancy in DEE Assam Recruitment 2018. Elementary Education Department – Govt. of Assam Recruitment 2018 dee.assam.gov.in official website published a new Jobs Circular notification for 122 Teacher Posts vacancy on October 2018. Latest Jobs Career Opportunities in DEE Assam Recruitment 2018. Latest Govt. Jobs in Elementary Education Department – Govt. of Assam 2018 dee.assam.gov.in Career Recruitment news, 122 Teacher Posts Vacancy in DEE Assam Recruitment Notification Apply Online Application Form. DEE Assam Recruitment News for Teacher Posts . Eligible candidates may Apply Online from 30th Oct. 2018 to 21st Nov. 2018 (dee.assam.gov.in Career). Further details of Vacancy in DEE Assam Recruitment 2018 for Teacher Posts – Age, pay Scale, Eligibility Criteria, How to Apply & other details on Mentioned below. Many Job Seekers are waiting for DEE Assam Recruitment Notification Advertisement 2018 dee.assam.gov.in, Finally your dreams come true, on this week of October 2018 Elementary Education Department – Govt. of Assam published Notification Advertisement for 122 Teacher posts , Here You Can Find details Vacancy, Age Limit, Salary & how to apply for this job at DEE Assam on below. Name of the Recruitment /Organization Authority : Elementary Education Department – Govt. of Assam. Name of the Posts : Teacher. No. of Posts : 122 Posts. Closing Date of Application: 21st Nov. 2018. Stating Date For Apply Online : 30th Oct. 2018. Closing Date For Apply Online : 21st Nov. 2018. Teachers 122 Check The Advt. For Above Posts Candidates can apply through online mode. Online application till open from 30th Oct. 2018 to 21st Nov. 2018. STEP 1 : Logon to https://dee.assam.gov.in/ (Apply Online Link).